Kiska is the westernmost of the Rat Islands in the Aleutian chain. Located 610 miles (980 km) west of Dutch Harbor, it is so isolated and inhospitable that it had no permanent inhabitants in 1941. However, Kiska Harbor (177.545E 51.982N) was probably the best natural anchorage in the western Aleutians, roomy enough for 40 ships. The island itself is 22 miles (35 km) long and has an area of 110 square miles (285 km2). Its highest elevation is Kiska Volcano (3966' or 1209 meters) on the northeast end of the island. Kiska Volcano shows occasional minor eruptive activity. The shores are rocky, steep, and backed by cliffs in most locations, leaving only a few small beaches suitable for landing operations. Japanese occupation and evacuation. The Japanese landed on Kiska in the predawn hours of 7 June 1942, during the Midway campaign, and quickly rounded up the tiny group of weather observers that were the only American personnel on the island. So miserable is the weather in the western Aleutians that it was not until 10 June that an American reconnaissance flight was able to confirm that the island had been invaded. The Japanese built up an impressive underground base and improved the harbor, but were unable to complete a usable airfield. The island was bombarded on 7 August 1942 by a cruiser-destroyer force as a diversion from the Guadalcanal landings. After the bloody battle of Attu left the garrison isolated, the Japanese made the decision to abandon the base. By 25 July 1943 the Japanese had assembled an evacuation force of 3 light cruisers, an oiler, and 11 destroyers under Kawase Shiro some 400 miles south of Kiska, where the Japanese waited for foggy weather to cover their evacuation. It was at this point that one of the most puzzling incidents of the war took place, known afterwards as "The Battle of the Pips." Warned by intelligence that the Japanese were on the move, the Americans had been patrolling west of Kiska, and on 22 July a group of PBYs picked up seven radar echoes ("pips") moving east. The targets were tracked for six hours before the aircraft were forced to return to base to refuel. Kinkaid ordered a powerful force under Griffin and Giffen, consisting of 3 battleships, 5 cruisers, and 9 destroyers, to intercept. On the night of 25-26 July, this force was steaming 90 miles south-southwest of Kiska in perfect weather conditions. An hour after midnight, Mississippi's SC radar detected seven radar echoes fifteen miles northeast. Four other ships confirmed the radar contacts and the fleet opened fire. Wichita could clearly see both the seven echoes and the peak of Kiska volcano 76 miles away. Twenty minutes later, the echoes were reported to have change course, and shortly thereafter the echoes began disappearing from radar. However, no visual contact was ever made and no wreckage was found. The Navy officially concluded that the ships had been firing at spurious radar echoes from distant mountain ranges. It is not implausible that a distant target could appear to be 15 miles away; range aliasing is a problem for most radars. But the echoes were not along the bearing of any of the Aleutian volcanoes, and the bearings from different ships were slightly different, converging on the same point fifteen miles away. It seems clear that something was there. A number of theories have been presented to explain the echoes. One possibility is that the echoes were from large flocks of Dusky Shearwaters, a species of seabird that flies over the ocean looking for plankton to feed on. The disappearance of the echoes would correspond to the birds settling on the ocean surface to feed. However, it is hard to imagine even the most complacent seabirds being undisturbed by the fall of large-caliber shells in their midst. Surviving Japanese records show no surface forces in the area at the time, but it is possible the echoes were from a force of submarines traveling on the surface at night. Recollections from surviving Japanese naval officers suggest that such a force was in about the right area at the time and was forced to submerge to avoid gunfire. 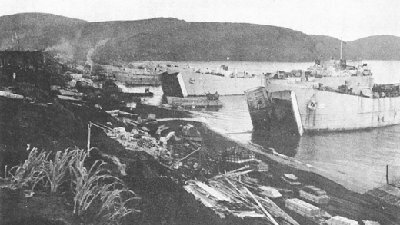 It is even possible that the submarines were deliberately decoying the American surface force: As a result of the "battle", the American ships were forced to return to base to refuel and rearm, and it was during this interval that Kawase's evacuation force made its dash to Kiska. The force reached the harbor on 28 July and embarked the entire garrison in less than an hour. Allied occupation. Although some American commanders were suspicious that the Japanese had already pulled out, based on reconnaissance flights showing no ground or antiaircraft activity, the Kiska landings took place as scheduled on 15 August 1943. The invasion force consisted of 7 Division (Corlett) and 4 Regiment, as at Attu, but reinforced by 13 Royal Canadian Infantry Brigade, the 5000 men of 87 Mountain Combat Team, and the 2500 men of 1 Special Service Force. They found that the island was deserted, but not before 21 men were killed in friendly fire incidents ashore and another 71 drowned when destroyer Abner Read hit a mine in the harbor. The island was not extensively developed as a base, the emphasis being placed instead on Attu to the west, but the Japanese fighter strip was completed as an auxiliary airfield and some seaplane facilities were developed.